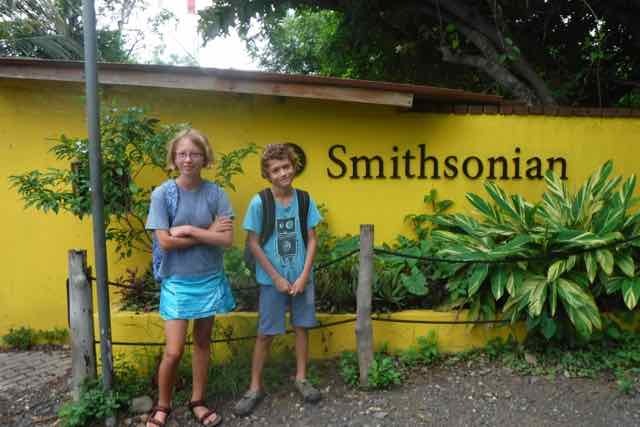 The only branch of the Smithsonian outside of the United States is here in Panama–the Smithsonian Institute for Tropical Research. They’ve been here for about 100 years, and have a whole bunch of different sites (including the elusive viewing platform up the Rio Chagras for which we searched so unsuccessfully). Their easiest-access spot for us is a nature center right across the street from our dinghy dock…and wouldn’t you know it–they have a summer camp! There are only maybe eight kids in the camp, ages 7-12; and while everyone understands English, there’s an awful lot of Spanish involved. The kids are coming back to the boat completely spent, both from having a regular 8-hour off-the-boat “school” day and listening to Spanish non-stop. It’s exactly the kind of thing they’d be doing if we were home, but it feels completely exotic, after having very little structure for so long. Meanwhile, Michu and I are having our biggest chunk of kid-free time in a year. Of course, we are using the time to our advantage, with exotic trips like Provisioning Without Kids and Let’s Explore The Chandlery. Today’s mission: Do All The Internet Stuff. Blog post: check. Summer camp sounds great! HUGS and love to you all! Nervously awaiting the next post. I now check several times per day. Please post something very soon so that I can stop holding my breath! We miss you at work Michu! Hi, Denise!! We’ve been out of cell range for weeks–sorry about that! Heading back towards civilization now. Rest assured, all is well. Seeing your post this morning put a huge smile on my face! So happy to learn that all is well for your family.